Congratulations on taking the leap from pool to sea, river, and channel. Here's all a beginner needs to know about open water swimming. Open water swimming is a distinctly different experience from what you're used to in the pool. The water is not only your medium - it is now your teammate, your opponent, and your obstacle course! Here you'll learn some of the most important aspects of swimming smart in wild waters. Make sure you are visible at all times - to boats, swimmers, folks on shore, and anyone else in the area. If you're in trouble, you'll want eyes to spot you, and you'll want to make sure you're in sight of vessels and be aware of their movements. Weather and daylight may also affect your visibility of and to others, so be mindful of when you swim, especially if you are swimming alone. Check the tides and be aware of the currents around you - they can be both your guide and your enemy, so make sure you're comfortable navigating the water's flow. It also helps to be aware of any animals that may make your swimming grounds their habitat. Know what temperatures you are comfortable swimming in, and know the signs of hypothermia and what to do if you experience the symptoms. If you're just starting out in the open water, do not try to swim too long or hard at first. You'll want to start with shorter and possibly slower swims and then increase the length of time you spend in the water as you build confidence. Be patient! Because open water can be choppy, your breathing style will have to adapt to the fact that you may not be able to get an inhale every time you roll to breathe. Take slow and deep breaths and be sure to exhale fully. Roll your body completely around to give you a better shot at getting a solid inhale, and breathe as frequently as you can. Don't hold your breath! Avoid lifting your head up to breathe - frequent attempts this way will tire or injure you, and you're more likely to get a gulp down the wrong pipe. 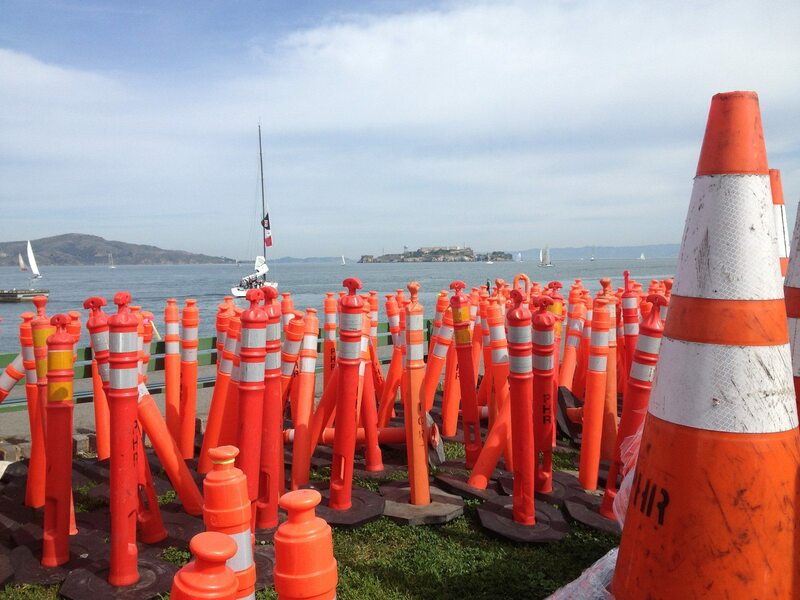 Without lane markers, you're going to use both your head and your eyes to keep on course. Know exactly where you are going, and use landmarks and other landscape features to help you focus on your landing. If you're swimming in an event, the coaches and coordinators will point out the best ones for you. Lift your head only as much as you need to in order to maintain flow and good positioning, and take a quick look. Try not to pause your stroke as you sight. The best time to sight is just before you breathe. Your mental preparation is just as important as your physical preparation. Individual swimmers know what internal dialogue works best for them. The most important thing is that the thoughts you guide yourself with are positive. It'll help keep you composed and power through. That said, be smart about your surroundings and the water conditions. Have fun and feel empowered! A NEOPRENE OR INSULATED CAP A must for most of first time Bay Swimmers. Your head is a computer. Keep it alert and working all the time. BRIGHT COLORED SWIM CAP You must be seen easily by other swimmers, rowers or the pilots, or your relatives that came to see you from the beach. MACK’S EARPLUGS Your middle ear is a bunch of filaments floating in a nice warm environment. In cold water, they will react just like the hair in your leg when you get cold, then voila! You will go way off balance, causing you to get dizzy, and sick. Silicone earplugs like Mack's help keep your middle ear warm. GOGGLES Many out there in the market, the most recommended are those made out of silicone, and CLEAR. They are flexible and easy to adapt to the shape of your face. Wash them with warm water the day before and mold them to your face, before race day or before swimming in open water. Anti fog drops can assist in visibility. ZOOMERS Swim fins can help you with your training and especially with your drills. WET SUIT Many are out there in the market. Our recommendation to get them in a place where they know about swimming in cold water and how the suit should fit. Not to tight or not too loose. If you are seriously considering to keep swimming triathlons or swimming for fun, get a good wet suit for yourself. Do not experiment with diving, surfing, karate, or abalone diver suits from 1954, as they will do more damage to your skin as to your stroke and will ruin your experience. Many swimmers elect to use a sleeveless suit, aka Farmer Johns. If you are used to swimming in cold water, feel free to wear your swim suit or speedo. TOWELS Very important! But if you forget it I’m sure someone won’t mind sharing. BODY GLIDE If you wear a wetsuit, it is important to put a lubricant around the neck and arms where you might chafe. A WARM HAT Your hair might get wet (! ), and so it’s good to bring a beanie or something. GARBAGE BAGS For wetsuits, or wet clothes. WARM AND DRY CLOTHING Also very important! There will be someone watching our stuff as we swim so you don’t get stuck commuting in your wetsuit. HOT BEVERAGE Bring soup or tea in a heat-insulating thermos - bringing enough to share is awesome! A GREAT SENSE OF ADVENTURE! The straighter you extend your arms out in front of you, the straighter you will swim. Avoid crossing your arms over your midline. The good part is that you already know how to swim. Now you have to adapt to choppy waves and eager currents! Since the open water can be a bit excitable and sometimes even scary, it's important to remain relaxed - and there are some ways you can bring it to each stroke. Don't forget to stretch and warm up before your swim! This will prevent injury in the water. Get your muscles warm before you stretch by lightly jogging (even in place) for a few minutes. Make sure to stretch your shoulders and legs especially, and stretch again after your swim to help relax your muscles after they worked so hard. BODY POSITIONING Keep your head and neck (and eyes!) down and relaxed. This way your hips won't sink and drag you down, and you'll be able to rotate them and swing gently side to side, helping you slice through the water faster and stronger. Keeping the hips loose also makes it easier to achieve paced and comfortable breath as you're not overworking different parts of your body. YOUR WETSUIT Opting for a wetsuit? Great news! It's going to keep you buoyant as well as warm. You can keep your kicks soft as you've got the benefit of being hydrodynamic - riding each stroke through to a glide will help you conserve energy and swim quickly. Let the wetsuit do some of the work, and you're likely to relax. GLIDE WITH DRILLS This is a great tip for all swimmers, especially those in wetsuits. The fact is, your arms do not have to be moving every second. Next time you swim and your recovering arm hits the water, don't immediately drag it back. Count to two or three before pulling your next stroke, and you'll ride in your own momentum. Easy peasy! If you suddenly feel cold in the water, there are a few things you can do to warm up. 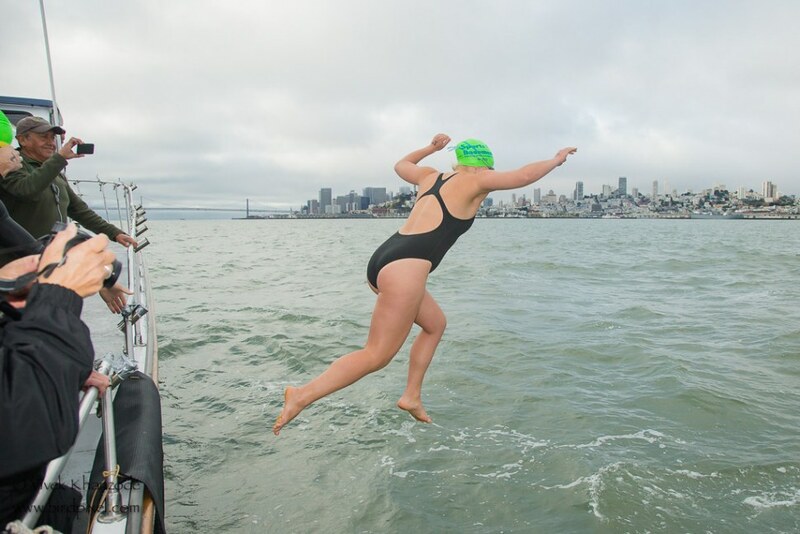 Rough water is something you'll encounter on a classic Alcatraz crossing and in many other open water swims. The more experience you have in it, the easier it will be to swim in. Chances are you'll take some gulps, get smacked in the face with unexpected waves, and be tossed around like a hot potato! In this circumstances, your biggest challenges are breathing, sighting your landing, maintaining form and progressing through the water. When taking breaths in choppy water, roll a little further than you normally would, and you might even have to lift your head more often. Take frequent breaths and take them quickly - if the water is unpredictable, you don't want your inhale with a side of sea water, and you might not be able to take another for several strokes. If you're running out of breath, just float. Be aware of what your body needs to stay calm and oxygenated. Try to sight less often. Lifting your head to check where you're going to frequently can see you battered by waves. But pay attention to them - if they have a particular rhythm, you may be able to time your sighting in a break or at the top of a wave. And just like breathing, sight quickly. The longer you have your head out of the water, the more time the waves have to gang up on you. In rough water, keep your core engaged to steady your position, but don't fight the waves or you'll tire or worse, panic. Keep your pulls strong to anchor yourself in the water and keep your body and glides long. Hide from wind and temperamental waves by staying under the water as much as you can. Instead of taking many strokes, make fewer and longer ones. 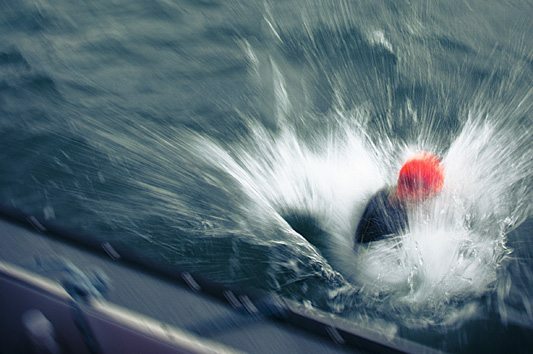 Chances are you're going to feel colder out of the water than you did in it. Don't panic if you feel like your skin is burning - this is normal! Normalize your breath by breathing slowly, and even inhaling and exhaling for five seconds each to return to a normal rate. Clear the carbon dioxide out of your lungs by making sure you take full exhales. Bundle up immediately in warm clothing, and don't forget a cozy hat to warm your head and ears. Don't fight the shivers; this is your body's way of generating heat. You can help it along by drinking hot liquids. Reward yourself with a hot bath or shower afterwards - it never feels as good as it does after a good swim in cold water! Announcing our partnership with Finis! 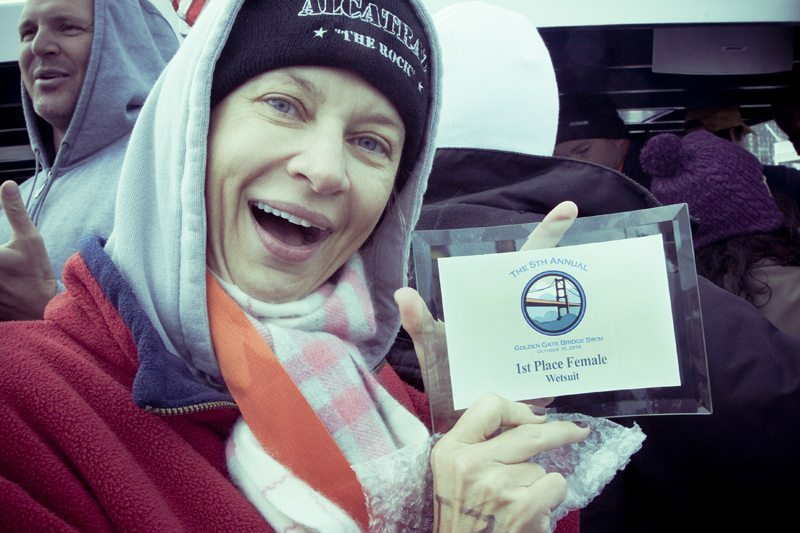 We are beginners and would like to train for the Alcatraz swim. Who do I sign up with for the Aquatic Park training and the date for the event. We are currently swimming about a mile in a Lake and One and Half mile in a 40 foot pool. 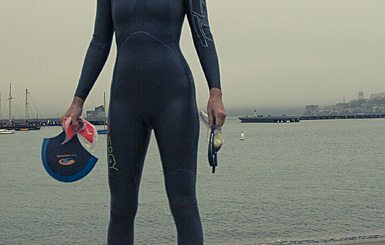 Our recommendation to swimmers of all levels is to attend our sessions at Aquatic Park on Thursdays at 6:00 p.m. or Sundays at 10:00 a.m. at Aquatic Park and sometimes, (check calendar) at Crissy Field. 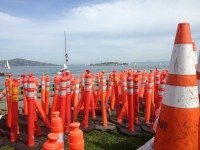 Your training seems to go on the right direction and these distances you are swimming so far are a good base to train for any of the Alcatraz swims adding some training in the bay. Hoping to see you in the Bay and please if you can register in advance in our website. Do not hesitate to contact us if you have any question about our training sessions and swims from Alcatraz program. We would like to sign up for one of your events can you give us a date for the swim and how do we sign up. Hi Daniel! Please check the calendar available in the menu at the top of the page for upcoming events. To read more about any of our events, click on “Swims” in the same menu. Happy swimming! For what ages do these lessons and swims apply for? I am thinking about starting open water swims, for im look for more of an adventure than racing in a lap pool. Hi Mel! Swim With Pedro swims are weekly sessions that are suitable for all ages and levels of swimmers. We typically break into groups to best get swimmers started at a comfortable level. If you’re comfortable swimming about a mile in a pool, you’re ready for open water. Check our calendar – we have Sunday 10am sessions year round at Aquatic Park and from March to October, Thursdays 6pm. Let us know if you have questions! I’m swimming about every 5 day in a lake with distances about 2 miles. It is taking me about 1:20. Should I be doing anything else to help train (lifting weights or other swimming distances) for the Centurion race in September. I’ am swimming with a wet suit. Is it possible for someone to call me so that I can pick their brain on the event?